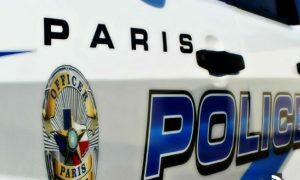 Paris Police met with a complaint in the lobby of the Police Department who advised that they had received an anonymous phone call and was told that she would receive a gift card if she would pay a one-time fee. The victim gave the person calling the last four numbers of her bank-card and found that it had been charged four times for the same fee. The victim canceled the card. The investigation continues. Paris Police responded to 111 calls for service and arrested five people on Thursday (Aug 16).